Dr. Rozlyn Linder is a literacy specialist, author, blogger, and workshop presenter. She is the best-selling author of four books on literacy, including the best-selling title: Chart Sense. She has over 16 years of public school experience in grades K-12. She has served as an academic coach, elementary school administrator, and district literacy school improvement specialist. Rozlyn has also taught First Year Composition, Introduction to Literature, and numerous courses at two different universities. Dr. Linder is certified in Special Education, K-12 Reading, Advanced Placement English Composition, Early Childhood Education, and Middle School Language Arts in the state of Georgia. As a life-long learner, Rozlyn is presently earning her second doctorate in Language and Literacy at Georgia State University. 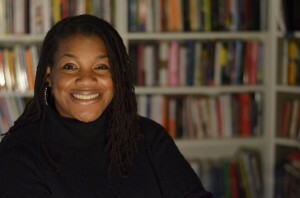 She is an alumni of Clark Atlanta University (BA in Early Childhood Education), Kennesaw State University (MA in Professional Writing), the University of West Georgia (Ed.S. in Instructional Technology), and Mercer University (Ph.D. in Educational Leadership). Rozlyn is married to Christopher Linder, a digital web developer and writer. They live just outside of metro Atlanta with their two charismatic daughters who make the world, as they know it, go round. You can connect with Rozlyn on Good Reads, on Twitter @rozlinder, her Facebook fan page , or on her Google+ Profile.